Illuminated Manuscript Koran, Illuminated incipit page with headpiece inscribed with the chapter heading for Sūrat Maryam, Walters Art Museum Ms. 568, fol. 1b, originally uploaded by Walters Art Museum Illuminated Manuscripts. 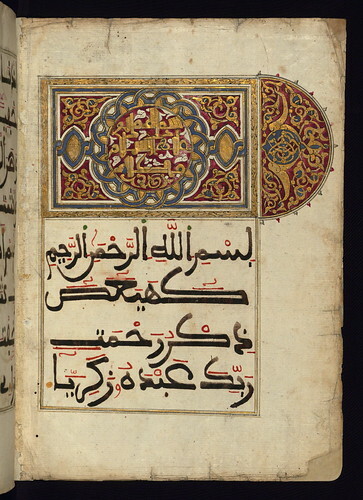 One of our most popular images is this one - A truly spectacular illuminated incipit page of a Koran. This Koran is written on Italian paper in a large Maghribi script, with vocalization in red ink, in the 12th AH / 18th CE century.